If there is one series that Atlus is known for amongst major RPG fans, it is Shin Megami Tensei. A long running series in Japan, MegaTen is extremely popular and a very well designed series. Sadly, America has missed much of the series, since Atlus has only released Persona and Persona 2: Eternal Punishment here in the States, and they are only a side story of the MetaTen series. But fans, rejoice! Atlus has decided to release another side story in the series in America. This one is called Shin Megami Tensei: Devil Children, but due to the over sensitivity of many Americans, Atlus wisely changed the name to Demikids. Though not part of the actual series, it does take place in the present (and other times as well), and features a lot of demons. It’s been compared to Pokemon, but how does it REALLY play? After you read this review, please also read Alex Lucard’s review of Demikids: Dark. The story starts in the present (well, in the year 200X, you know how that goes), and three students from the Rem School form up the Mystery Club, which is a group devoted to studying and experiencing the unknown. Jin (the hero of the Light version) and Akira (the hero of the Dark version) are both very interested in the occult, along with the third member of the group, Lena. One day, Lena finds a book about demons in the library, and Jin craps his pants. No, not in a bad way. See, Jin LOVES demons and wants to summon one really bad. So Lena and Jin pick up Akira, who still actually goes to his classes, and along with a mysterious new student, Amy, they go to the library. After finding the book, the first thing that Jin does is summon a demon! Of course, the demon isn’t the nicest of creatures, and it grabs Lena and starts throwing her about. In steps Amy, who gives the two boys devices that they use to summon good demons of their own. Jin summons his new guide, Rand, who helps them drive off the evil demon. They then find out that time rifts are appearing all over the world, and if they don’t do something about it, the world will be destroyed. So Jin, Rand and Lena go with Amy to Valhalla, and Akira goes with his guide, Gale, to the demon town of Dem, and they will work together, though apart, to save not only our world, but others as well. Sure the story sounds rather grandiose, but it’s really much deeper and complex than that. I just find it difficult to summarize it properly. What it boils down to is that there are many worlds in danger here, all from a group called the Imperium, who are fighting the Rebels of Valhalla. It turns out that Jin and Akira are DemiKids, which are part demon, part human, which makes them capable of controlling demons in battle. They must use these powers to fight the enemies that are causing the problems, and help return all the worlds back to the way they belong. There is quite a bit of intrigue and betrayal, and unlike many games, it’s not that predictable. The characters themselves are very likable, and I couldn’t find anything I DIDN’T like about any of them. This is a skill that Squaresoft needs to learn. And the story itself is quite unique, even if it doesn’t seem that way from my description. Plus, the story in the Light version is different from the Dark version, making it necessary to play both to get the whole picture. For a Gameboy game, the graphics are excellent. Atlus really used the full capabilities of the GBA hardware with this one, and it shows everywhere you look. The environments are expansive and lush, the character sprites are as detailed as possible, and the portraits during cut scene discussions are even better. Probably the best aspect of this though is the enemy graphics. All battles are fought from a first person perspective (a la Dragon Quest) and all the enemies are not only very detailed, but also completely different. I haven’t seen a single enemy that looks like another, except for Jack Frost type enemies, which have several different variations, except with different elements. Despite the similarities, it’s not a simple palette swap like most games. They drew completely different sprites for each one. Wonderful job all around here. The ONLY complaint I have AT ALL is that the main character Jin has a headband with a card or something on one side (the right side, I believe). When he walks around on the map, walking left or right, the card thing is always facing towards you. Like I said, it’s a small thing, and it really means nothing. If there is one thing that the MegaTen series is known for, other than demons and stuff, it’s sound. Though I haven’t played any MegaTen games themselves, I have played Persona, and the sound in that game was excellent. This title is no different. Even though the GBA is only capable of basic MIDI quality sound, it amazes me how many great tunes they were able to throw in this title. Sure, it’s not CD quality, but every new tune is a pleasure to hear. I just wish that they would play the Velvet Room whenever fusing demons. Really, I haven’t encountered a GBA title with difficult controls, but this one is simpler than most. You use the directional pad for movement, of course. The A button is used for interacting with people and objects, and selecting an option when in a menu. The B button is used for canceling in a menu. The R/L buttons are largely unused except when in a menu, usually to page up/down, though the R button is used to hop on your guide’s back for a quicker ride. Start brings up the menu and Select brings up the map. Easy, right? Even if you don’t pick up on it, the game gives a pretty good explanation when necessary. Let’s look at the numbers. There are over 380 different demons to be gotten, by different means: coercing to join you, fusing two demons to create another, prizes, casino awards, and various other ways. Chances are, unless you check a FAQ (there aren’t any as I’m writing this, I checked), you won’t be able to get all the demons in one go. In addition, there is so much stuff in this game that you can’t get unless you link up with the Dark version, so chances are, you’re going to need to play through more than once to get everything. And if you’re a gamer like me, you HAVE to get everything. So playing through more than once is a foregone conclusion. And you’ll have fun doing it too. The difficulty of this game is hard to place. It’s not an easy game, but it is the easier of the two different versions. The game walks you through all the different aspects of battle, but it also takes a bit of intuition (or reading the manual) to get everything down pat. Likewise, the battles progress in difficulty very nicely, which requires you to improve your own demons as much as possible before moving on to a new area. And be careful, this is not a forgiving game. If you don’t watch yourself and keep your life up, you will die very quickly. Many people will call this game a Pokemon rip-off. I will disagree with that assessment, because having played Persona, I can see that this is the natural evolution of the MegaTen series. Rather than first person dungeons and top down battles, you have first person battles and top down dungeons. Rather than turning into demons, you control them and have them do your bidding. Sure the details may seem similar to Pokemon, but there is so much more to the game than that. Rather than leveling up your demons, you must fuse them with other demons to make them stronger. You can even fuse them with certain items to give them skills. And your demons can inherit up to 3 abilities from the “parents” that are used to fuse them. So, the methods of improving your demons are very unique. And Jin himself plays a part as well, because his own level (which is actually improved by winning battles) determines how high of levels your active demons can have. So while some of these things may be present in other MegaTen titles, they are very unique for me. I’m sorry; it is difficult to type this right now, because to be honest, I’d rather be playing the game itself. But alas, I wouldn’t want Mr. Lucard to hunt me down for reneging on my promise to cover the title. Seriously, it’s that damn fun. Do you like “catching ’em all”? Do you like leveling up stuff? Do you like a nice list of what you’ve caught? It’s all here. Do you like neat unlockable type stuff like background music? Do you like a handy encyclopedia of information? Do you like casinos, quizzes (with prizes of course) and hidden items? That’s all here too! Really, this game has everything I look for to make it fun. The game is fundamentally about recruiting new demons and fusing them to make stronger demons. It’s got minigames and hidden stuff galore. And it’s got a casino! Plus, you can win strong demons from the casino as well! So really, I found myself going out on recruiting runs for an hour, coming back and fusing as much as I could. And unlike the rest of the demons, Rand, your guide, can only be leveled up by fusing, but he doesn’t change into a different demon by this method. So often, any leftovers I couldn’t fuse would be “fed” to Rand. So, in all my years of playing RPGs, starting from way back on Final Fantasy and Dragon Warrior (the first ones), I’ve never, EVER had more fun leveling than I have with this game. What’s normally a tedious task is quite enjoyable. Even leveling up Jin goes really quickly, but leveling up the demons themselves do not, but you won’t notice it because it SEEMS quick. Think about it: the Pokemon generation is getting older, and starting to think that those games are too childish, but don’t want to admit to enjoying them. So in comes Demikids. It’s a game that if you read a little about it, you realize it’s about controlling DEMONS. Sure, the demons are sometimes cute (look at Jack Frost), but sometimes horrendous. Plus, the gameplay is excellent and complex, so that’ll rope in the players. And what parent wouldn’t mind getting their kid the game? Even for those parents who LOOK at the ESRB ratings, it’s rated E, so there can’t be many qualms about getting it then. This game is probably one of Atlus’ best chances for mainstream success. Here’s where I’ll briefly discuss the gameplay aspects I haven’t touched. Everything is simple, yet complex. You control Ren and Rand throughout the maps from a top down perspective. In the areas where there are no enemies, you move at a high rate of speed with Rand following you. On maps where random encounters occur, you walk at a much slower rate, but fortunately you can hop on Rand’s back for a quicker journey, plus he can hop over certain gaps that you’d normally not be able to jump. When you battle, you have the options of fighting, running, or recruiting. Fighting is pretty standard, where you can attack, use magic (which depletes MP) or skills (which depletes HP). Recruiting is very familiar to me from Persona. You pick one of your demons to do the recruiting, you pick a demon for them to recruit, you choose a stance for them to take (Friendly, Forceful, Threatening, Diplomacy, etc) and the demon responds by doing anything from joining your group, demanding money or items to join, or even paralyzing the recruiter or attacking the party. If the demon joins, you can attempt to recruit more immediately, but if they do not join you, you’ll instead have to wait a turn (either defending or fighting) to recruit again. Once they have joined you, you can use them or fuse them with other demons to make stronger ones. Initially, you are only allowed to hold 3 demons in your group. When one dies, the next in line takes its place. 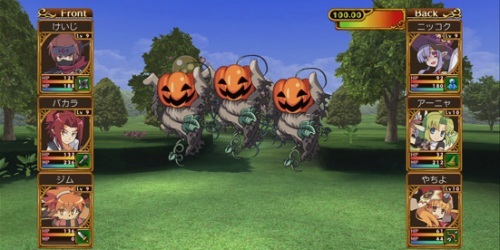 The object that summons the demons is called the Demonloc, and later you can get a Kingloc, which allows you to hold 3 more demons, and summon an additional one into each battle. You can find and buy items to equip to the Locs, which do things from improving attacks to increasing chances of recruiting to increasing the amount of demons you can have in your party. Everything about the game is easy to learn, but difficult to master. Finding the right combinations to improve your existing demons is a skill that is quite difficult to master and takes quite a bit of trial and error, but becomes very rewarding. The game itself has a lot to it, and you can do as little (simply breezing through the game and only fusing when necessary) or as much (trying to fill up the Demonary and get all the little Loc add-ons and CDs (back ground music)) as you want. Either way, it’s a very enjoyable journey. If you couldn’t tell by now, I love this game. It is truly the best game I’ve played on the Gameboy Advance thus far. It’s simple, yet complex, and any RPG fan can get into it. This game is perfect for people that think Pokemon is too kiddie (even though it’s not), and can be enjoyed by fans of all ages. Plus, it’s the easier of the two games, so you may want to pick this one up, try it, then buy Dark. So please, buy this game. Atlus has already ported Shin Megami Tensei I and II to the GBA, so if this game sells well enough, it may convince them to localize MegaTen to America finally!